Earlier today I was going through my collection of original Civil War era newspaper and came across an issue of Frank Leslie’s Illustrated from July 9, 1864. 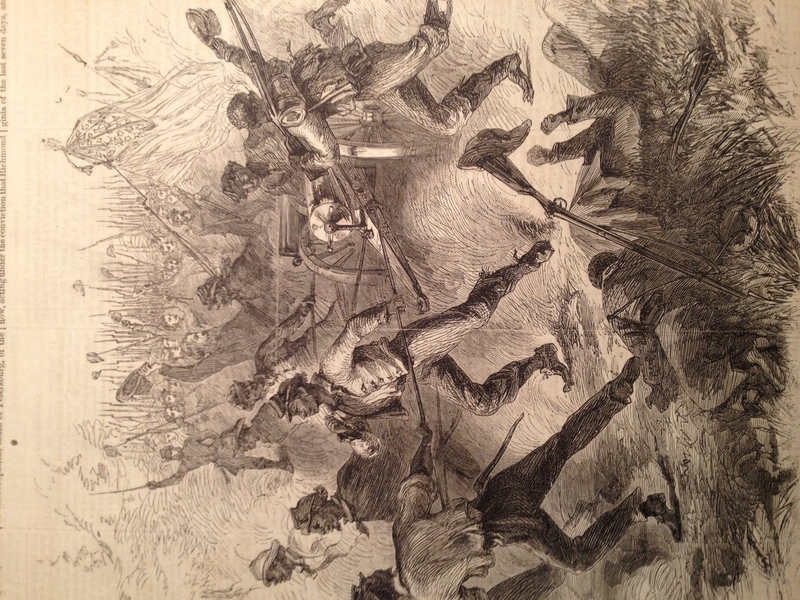 The first page includes this wonderful illustration of the charge of General Hinks’s “colored troops” outside of Petersburg in mid-June. Ohio troops cheer them on in the background. It’s a wonderful find as I continue to explore how white Union soldiers responded to the use of USCTs a few weeks later at the Crater. It’s a powerful image, but we should proceed carefully in interpreting it. For some it is an image that fits into a popular and satisfying narrative that is framed around slavery, emancipation, military service, freedom, postwar promises of civil rights, and the eventual slide into Jim Crow. From this perspective we may be tempted to dismiss the cheering of the Ohio men as something fleeting or, in hindsight, even insincere. Such an interpretation, however, misses a salient point about white Union soldiers. They were not engaged in a civil rights struggle. To me the image highlights a respect that black men earned on and off the battlefield as a result of donning the blue uniform. Blacks and whites experienced the same hardships and dangers and were united in the goal of putting down a rebellion and preserving the Union. Historians such as Barbara Gannon, Andrew Fleche, Caroline Janney and others have convincingly argued that it is this respect that continued through the postwar years in G.A.R. Halls, historical accounts and other forms of remembrance. The positive reception that blacks enjoyed from their white comrades on many battlefields (though certainly not all) was fragile and could be easily undone depending on the outcome of the next battle and news from Washington, D.C. and the home front. The same men who cheered one day could slide right back into a virulent racist rant the next day. It’s a complex picture that is not easily or neatly explained. I’ve heard it said that there is no Black or White in the trenches. I don’t know how true this is, never having served in battle myself; but it seems that there is something to the notion that the brotherhood forged in battle can overcome some pretty dramatic prejudices. This is most obvious in integrated units, but I am sure that even during the segregated era, the personnel of a white unit in reserve could watch a black unit go into battle and identify very closely with what the black personnel experience. One learns mighty fast that blacks’ blood runs just as red, and whites can be just as cowardly. In my own time in the service during the later part of the Vietnam War, anyone, of any color or race, was often ridiculed by what was then the ‘anti-war’ crowd. All of us in the service/US Army considered ourselves all green, the color of our fatigue uniforms. Perhaps this feeling of shared service was even present at that time between USCTs and white US soldiers. Previous post: How Would You Teach Secession?